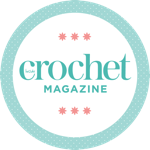 With the clocks just going back and darker evenings now firmly upon us, it’s with a definite “brrrrr” that I’m turning to warm woolly crochet and thick cosy garments this month! Top of my list is Annelies Baes’s aptly named Cocoon Cardigan, worked in a thick yarn and perfect for layering under my winter coat. I’m also in love with Claire Trowbridge’s Star Stitch Skirt, a stylish pencil skirt ideal for work or after-work drinks. And Kath Webber’s stunning motif-based kimono will brighten up any autumn outfit while also providing a cosy extra layer in pure Merino wool. Elsewhere in the magazine we’ve got a cheery fox hat that’s sized from babies right through to adults, so the whole family can join in the fun, an adorable toadstool cottage, a stylish shawl, a sweet baby blanket and much more. I’ve also designed a simple beanie in a great tweedy yarn that’s fantastic for keeping out the chill in the air – I think I might have to make a few more in different colours! And having moved house recently, I’m enjoying the chance to brighten up my new home with handmade pieces – Lucy George’s quick-hook bag on page 71 is perfect for doubling up as some much-needed yarn storage in my living room!